The postal history of China is very fascinating as much as complicating if one considers the gradual decay of imperial China, the years of civil wars, the Japanese Occupation in the 1930s and World War II. Early records from the first millennium BC show evidence of regular governmental postal service during the Chou Dynasty. By the 12th century, organised postal services existed as per Marco Polo’s records. He reported the mailing of private letters by the Min Hsin Chu (a system of letter guilds) and the setting of post stages, as many as 10,000. The Treaty of Kyakhta in 1727 allowed the regular exchange of mail between Imperial China and Russia. In the 19th century, the Opium War ended the policy of isolation and ‘treaty’ ports opened, allowing some countries to operate their ‘foreign post offices’ from 1844. In 1865, Shanghai organised its own local post and the Englishman Robert Hart set up a mail service for the Imperial Maritime Customs for carrying consular mail to and from the ‘treaty’ ports. This function was available to the public on May 1878. Hence, China's first postage stamps, the ‘Large Dragons’ were issued to handle payment, and were inscribed "CHINA" in both Latin and Chinese characters, and denominated in candareens. Initially, all mail to foreign destinations went through Shanghai, but by 1882, twelve post offices opened. Twelve years later, the postal operations were reorganised, Min Hsin Chu and the Shanghai local post ceased to operate, Customs Port became the Imperial Postal Service (effective 1 January 1897) and the postal system adopted cents and dollars as the new units of currency. The lack of postage during the first half of 1897 forced the use of existing postage and revenue stock surcharged in cents, with some varieties. The first new stamps, inscribed "IMPERIAL CHINESE POST" went on sale in August 1897 with twelve values, ranging from 1/2c to $5. These lithographed stamps were printed in Japan and used desgns of a dragon, a carp and a wild goose. The paper was watermarked. The following year, a new series of engraved stamps printed in London were issued in similar designs by using thicker Chinese watermarked paper. The inscription changed to ‘CHINESE IMPERIAL POST’. New printings commenced in 1899 but used non-watermarked paper and from this run, stamps were in use until the end of the Empire. It’s noticeable that the compliance to the Universal Postal Union saw the introduction of three values and the change of some colours. The anniversary of the first year of reign of Emperor Xuantong was ideal for the first Chinese commemorative stamp in 1909, printed on 3 denominations and depicting the ‘Temple of Heaven’ in Beijing. The 1910s - The revolution of 1911 resulted in overprints on the imperial stamps in 1912. 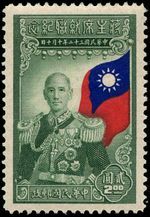 Examples of the overprints are that of ‘Foochow’ (neutral post office available to both sides) and ‘Nanking’ and ‘Shanghai’ (indicating part of the Republic of China). Postmasters throughout the country used unofficial overprints. The first new designs of the Republic were two commemorative sets of 12 each, the first set depicting Sun Yat-Sen and second Yuan Shikai. Both issues were available from 14 December 1912. Chinese definitive postage stamps made their mark in May 1913 with the release of the ‘Junk design’ stamps. Progressively, the higher issues depicred a farmer reaping rice and the ‘gateway to the Hall of Classics’. Initially printed in London, the stamps were manufactured in Beijing from 1915. The series was re-engraved in 1923. The 1920s - China produced new commemorative issues, of four stamps each, during the 1920s. These are the 25th anniversary of the Chinese Post Office (1921), the Temple of Heaven / New Constitution (1923), Marshal of the Army and Navy Zhang Zuolin (1928), the Unification of China / Chiang Kai-Shek (1929) and the State Funeral of Sun Yat Sen (1929). The 1930s and 1940s - In 1931, new definitives depicting Sun Yat Sen and in 1932, the ‘Six martyrs of Kuomintang’ were printed in volumes and were well used in the next several years. Manchuria was invaded in 1931 by the Japanese and ‘Manchukuo’ issued its own stamps. During World War II, some existing postage stamps from previous issues were surcharged. Towards the end of the War, the Nationalist Government was still struggling with the Communist forces. Still, the postal authorities were able to release some commemorative issues on President Lin Sen who died in 1943, the anniversary of Chiang Kai-Shek in October 1945, and for celebrating the Alllied victory. Needless to say, as with many European countries affected by the War, China experienced increased inflation in 1945 and 1946. The need for postage of higher values necessitated the release of older stamps with surcharges up to $2,000. A new design of Sun Yat Sen was inscribed with the value of $5,000 but in the following year another issue came out with $50,000 that was superceded with the 1948’s $5,000,000 stamp! Adoption of a gold yuan standard delayed inflation only for a short time. This $1000 stamp was issued in early 1949. In 1948, the ‘gold yuan’ standard was adopted and existing stamps were surcharged with values from 1/2c and up. This currency reformation proved infufficient due to inflation as by early 1949, the overprinted values reached the $5,000,000 mark! In desparation, the government printed undenominated stamps and sold them at the daily yean rate. Later, the silver yuan standard was adopted and more stamps were overprinted. By August 1949, the Nationalists’ last issues were denominated in silver Yuan. The postal system of the People’s Republic of China was established in Beijing in that year and was expanded to the liberated areas. This enabled the authority to cease the sale of regional stamps by end of June 1950, with the exception of the Northeast Liberation Area and the Port Arthur & Dairen Post & Telegraph (by end of 1950). The unified administration issued its first postage stamps in October 1949 that consisted of four with designs of ‘lantern and the Gate of Heavenly Peace’. The first definitive series were released in February 1950 and featured the Gate of Heavenly Peace against a background of clouds. These stamps came in nine values ranging from $200 to $10,000. The design was modified several times over the next few years and today, philatelists have identified six issues. By the end of 1950, all provinces were entered into the unified postal service.